Advisory boards and commissions help advise the county commissioners and other elected offices and departments on matters concerning public administration, planning, budgeting, and other functions of local governance. Recruitment for board members occurs two times a year, typically in January and July. Recruitment periods are currently closed. Recently we compared the demographics on our advisory boards and commissions to countywide census information. 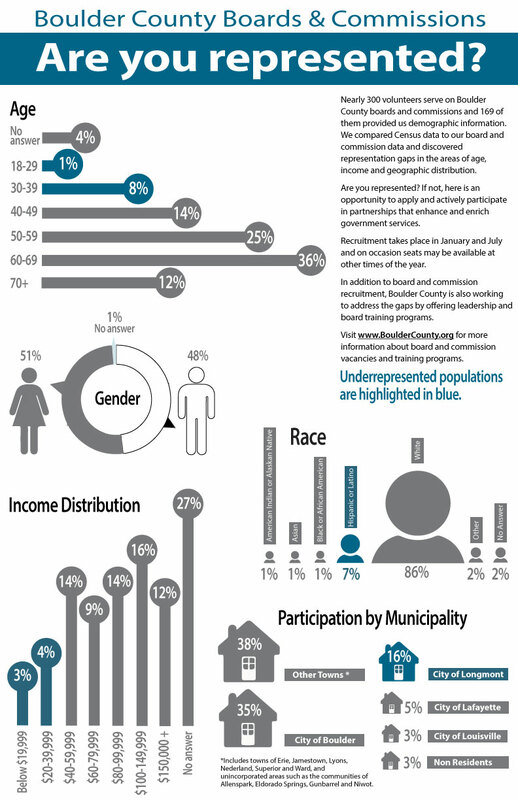 You can view an infographic that highlights which areas of the county are underrepresented. Please email advisoryboards@bouldercounty.org or call 303-441-3500 for more information.